Sielschott, Walsh, Keifer & Regula CPA Austin Sherer speaks with a client about her 2017 tax information. 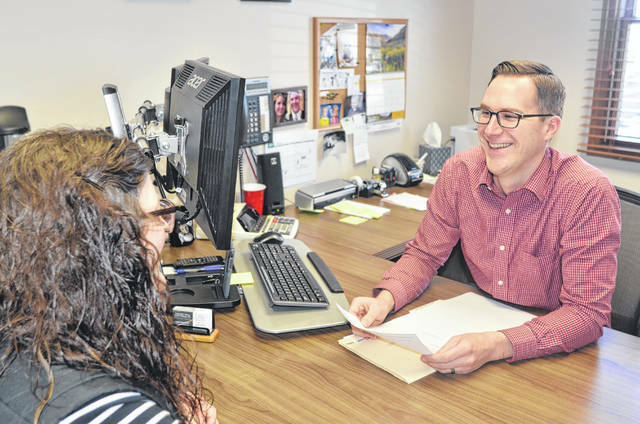 LIMA — As the April 17 tax deadline quickly approaches, area tax experts provide essential tax tips for individuals who plan to file relatively close to the deadline. Sielschott, Wash, Keifer and Regula Certified Public Accountant and Certified Valuation Analyst Bob Sielschott recommends tax payers make sure all documents and data are complete prior to meeting with an accountant. Those documents include 1099s, W-2s, K1s, 1098 and other income related information regarding wages, interests, dividends and investments. Sielschott suggest taxpayers wait after the Jan. 31 deadline to ensure that they have received all of the documents needed to file. The Internal Revenue Service is notified of each individual’s income, so it is essential all the information matches. If not, the IRS will send a notice for the proposed amount and the individual will have to explain why the information is incorrect, according to Sielschott. When new clients are filing they should come prepared with the last three years of tax returns and if they own a business they should come prepared with all sales and expense documents. Sielschott said the goal of his firm is to ensure clients pay the minimum legal tax and are in compliance with the tax code. Liberty Tax Service Enrolled Agent Nancy Rumschlag recommends individuals who are self-employed and have received 1099 miscellaneous form should gather all expenses to itemize supplies, mileage and capital expenditures. If the individual owns a rental property, he should document all of the total rent on each property and other expenses that could be itemized. Those who were on unemployment should receive the 1099-G, a form which will report how much money they have received while unemployed. Rumschlag also suggest that individuals who have had a larger tax bill could contribute to an IRA and that could be deducted on the tax return. Also, all insurance information should be gathered from either their employer or from the marketplace. College students, depending on qualifications, could get an education tax credit for tuition, book supplies, education credit, through the 1099-T form. Clothing or equipment that is donated to charities can also be itemized as well as quarterly IRS payments and other payments made to Ohio during the 2017 tax year. Working spouses who have had to pay a babysitter or daycare provider can also receive a tax credit. All they would need is the Social Security number of the person or the employer identification number of the company who provided the services and the amount that was paid. If for whatever reason an individual does not have all the documents that they need they are able to request a six-month extension to file taxes. Those who cannot afford to pay the amount owed for their taxes can also request installment payments. One of the main documents clients forget about are credit card and bank statements, which Jennifer Ward, a Jackson Hewitt franchisee, said is important for things like doctor bills and real estate taxes purchased with a credit card. Ward said at March is a good time to get files organized for the 2018 tax year. Although she said that there is a possibility there will be a higher standard deduction in 2018, it is important to keep tabs of all of their records. Fortunate Accounting and Business Solutions Enrolled Agent Ibi Ojo said the biggest thing to consider when looking to get your taxes filed is not only finding a qualified tax preparer but also looking at the ethics of the preparer. Tax preparers should have an EA, CPA or registered tax return proprietor designation and she suggests individuals check out https://www.irs.gov/tax-professionals/choosing-a-tax-professional, a site that will allow them to choose a tax professional in their city. She also encourages individuals to review the return after its been prepared and ask plenty of questions before signing. Not under any circumstance should someone sign a blank return or authorize the refund to go into the preparer’s bank account. Individuals who file for the six-month extension will accrue a .5 interest rate each month until the taxes are filed. Those who do not file their taxes or fail to pay their balance will have a 10 percent penalty. “You are better off filing an extension and paying as much as you can than getting hit with a 10 percent penalty,” said Ojo. Those who owe the IRS can pay with a debit card, credit card, through their bank account or can sign up for a payment plan. Ojo acknowledges it is easy for individuals to procrastinate and wait to file their taxes because it can be a hassle and time consuming. However, once they pull all the information together and find a reputable and qualified professional, everything else will fall in place.